Have a good weekend? If not, here’s some help. If so, it’s level-up time. It was a true Texan invasion when Jester King came to Amager. We honestly lost count but we believe at least 8 or 9 of these cowboys came riding in – dragging their suitcase rollers along. a beer was indeed brewed in this massive state of being wasted, and a bit of a beast it is. We took the original version of Jester King’s Black Metal – the one with a British ale yeast – and gave it a bit of a Danish spin. Hence Danish Metal was born. It’s rich and potent and powerful – just like a Texas steak. Or something. But we’re babbling. We’ll shut up now. Sorry. Dany Prignon, the “master-brewer” of Brasserie Fantôme of Soy-Erezée has made a new exiting brew. “The Coffee Ruby Very Bitter Taste” a dark-orange to light brown spicy-Saison with a coffee flavor. The flavours are dominantly the typical Fantôme spicyness with a lot of fresh coffee aromas. Full-bodied and complex brew. This is a Dark Farmhouse ale that was fermented 100% in the foeder before being aged in Apple Brandy barrels with wild yeast for a year, prior to being conditioned in the bottle on Brettanomyces. Saison de Banc Vert, or Green Bench Saison, is the flagship in Green Bench’s Saint Peter’s Belgian series of oak fermented Franco-Belgian style beers that are aged in a custom built foeder made of 75% French Oak and 25% American Oak staves. Dry and crisp, this beer is a showcase for their house farmhouse strain of yeast, giving fruity esters with notes of citrus and spicy, peppercorn notes. This beer is a sour peach farmhouse ale fermented with lactobacillus and yeast that is conditioned on American white oak. If that’s not enough fun, this beer is also dry-hopped with Azacca and Jaryllo hops. 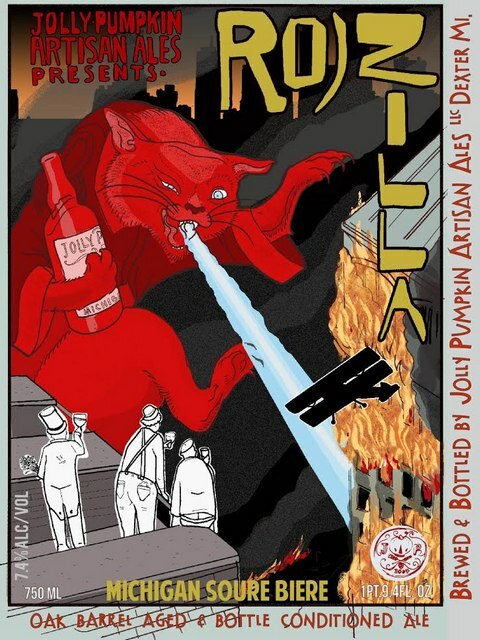 A fresh spin on Jolly Pumpkin’s flagship sour amber ale is – La Roja Du Kriek. 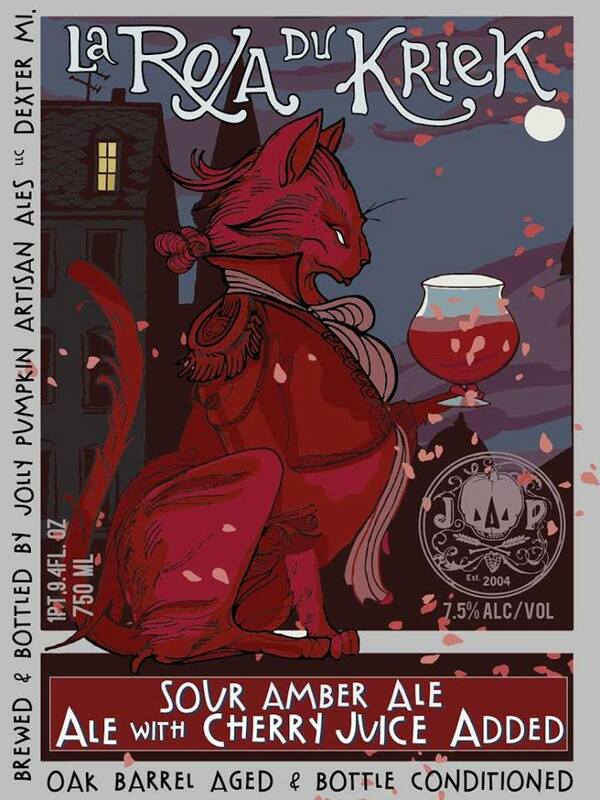 This pumps up the volume on their oak barrel-aged, bottle conditioned beer by blending 3,100 gallons of 2013 La Roja with 50 gallons of Michigan tart cherry juice. Michigan Sour Biere. Aged for a year-and-a-half in a 100-bbl oak foudre before being blended with a few “normal” size barrels of varying ages to create a complex, mellifluous combination of flavors and sophistication. From the beer geek breakfast series – the beer that really put Mikkeller on the map – It’s time to introduce a hoppy sidekick to the family, known as the Beer Hop Breakfast. A high quality brew as you’d expect, but with the addition of some carefully selected hops that compliments the coffee real well, as with the other ingredients. The perfect, well balanced black india pale ale. Time to revise those breakfast routines. In the spontan series we present Spontanbeetroot – this time, forming an alliance with sea beetroot that were generously added underway the brewing process, creating a truly unique and distinct, sour beer. In the spontan series we present Spontanapricot – this time, forming an alliance with Lingonberrys that were generously added underway the brewing process, creating a truly unique and distinct, sour beer. Go crazy, swedes! The first new beer of 2015 is a smallish, one-off batch of around 50 barrels called “Flowerland”. You may have heard how difficult is has become for brewers to acquire some hops. There are many affects this has on a brewery: like waiting years to add a new beer to the repertoire, or replacing hard-to-get hops with cheaper and more widely-available varieties. Either way it makes for a frustrated brewer! With Flowerland we took advantage of a rare correspondence – an email from someone selling their excess hops, in great shape and varieties interesting enough to build a beer around: Apollo, Rakau & Southern Cross. Smoked Imperial Russian Stout. This beer lies at the intersection of our most popular beers & one of the hardest beers to brew. The pains of brewing this beer are not at all about nuances and fine-tuning. It’s much more about brute strength, wading through knee deep wet grain, a grueling 15-18 hour brew day, and an 8,000 pound double-mash grist (one full acre of barley). Doors are slammed, names are called, we curse wet grain and bearded Russians… and it all turns out great in the end! When Chase Healey from Prairie Artisan Ales came for a visit, we brewed this Brett Belgian Ale, paying homage to a world famous Trappist ale, to the legend of Matilda of Tuscany and the connection between Canossa and Orval Abbey, and Chase’s state of birth, Oklahoma. No further explanation needed, right? Only available on a limited number of bottles.